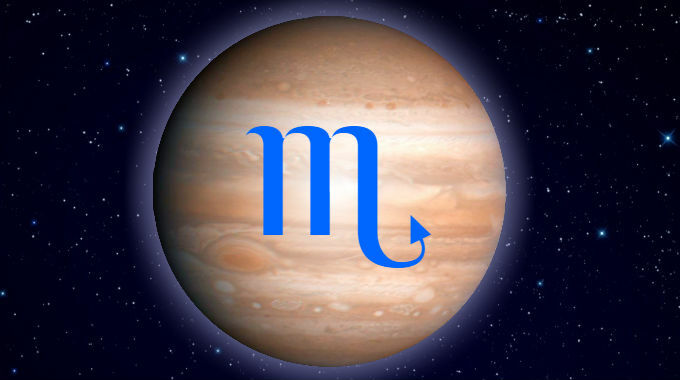 Jupiter in Scorpio is in a fixed water sign and takes on the qualities of its ruler, Mars. This is someone for whom opportunity and abundance lies in shrewdness, capitalizing on another’s disadvantage or taking the low road. It rewards those who take risks, who live on an edge of sorts. There can also be an exaggerated sense of profiting at another’s expense to the point of cruelty or criminality, or being an advocate for unsavory or unpopular causes. There is often a struggle with remaining ethical within the context of morally compromised circumstances. There can be a philosophical interest in the ethics of taboo or “dark” subjects. You can be the sage, the professor, the fount of wisdom when it comes to seeking “forbidden” knowledge and counsel. This can be good for businesspeople, morticians, researchers, detectives, forensic scientists, psychologists, occultists, etc. This is especially true if you were born with Scorpio, Sagittarius or Pisces rising. However, this can also describe others in your life who are relevant to the houses where Jupiter, Sagittarius and Pisces are placed. Whether you experience the better or worse significations of this position depends on whether you were born during the day or at night, and the kind of aspects it makes with the other planets.